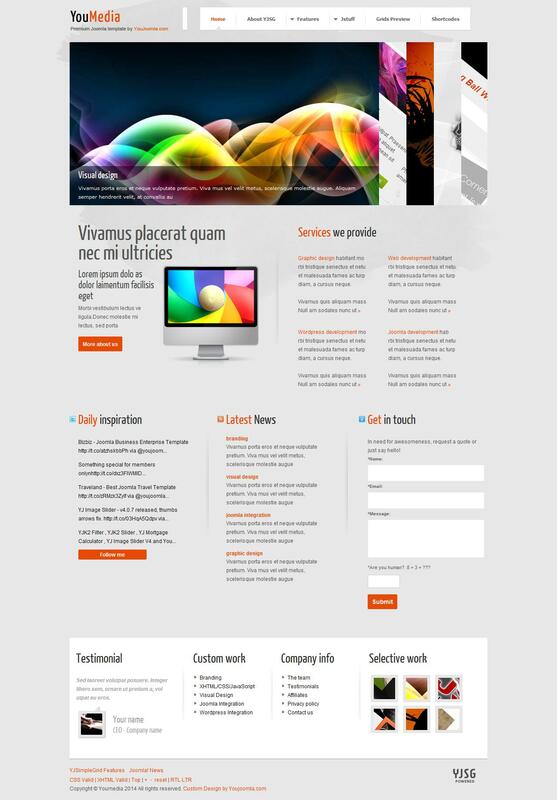 YJ YouMedia - brilliant professional template to create a portfolio of design studio YouJoomla. This template comes with 8 styles combos combined with 2 background images and 4 primary colors style. The unique location of extensions and new module Yj Ajax Contact, make it especially attractive and stylish. In the assembly includes popular modules studio: YJ Accordion slider, Multimediabox 2.0, YJ Newsflash V3 and YJ Latest Tweets, which will help nicely and efficiently use the space on the site. The template uses all the SEO parameters and functions in all modern browsers, has 48 module positions, 8 combo styles CSS, smooth dropdown menu, split menu, full compression on the server side, additional styles typographic styles, adjustable width and more. YJ YouMedia a high speed, the presence of the optimized code, and full support for a variety of mobile devices. Gorgeous design template that meets all modern requirements, perfect for creating websites on any topic and functional structure. Proprietary platform YjSimpleGrid provides full access to the basic layout options, ranging from the size of the blocks to select a color and design of the site.